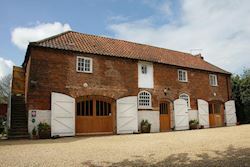 Our 18th century stable block was lovingly restored using natural materials to create two places to stay, a room for small courses and a little local history museum. The accommodation is warm and welcoming with peaceful bedrooms, lovely living areas, beautiful bathrooms and well-equipped kitchens. The one-day courses are both for local people and those spending their holiday here. The local history museum currently features information and memorabilia of the Great War. Warm and welcoming retreats. Wood-burning stoves and beamed ceilings create a warm and cosy atmosphere. Floors are covered in recycled cotton mats, fabrics are soft and natural and colours are warm and earthy. 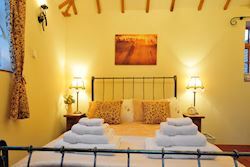 The luxury organic wool mattresses are covered in quality bedding and cotton quilts. Bathing is a luxury and kitchens so well equipped you’ll love cooking your meals ‘at home’. 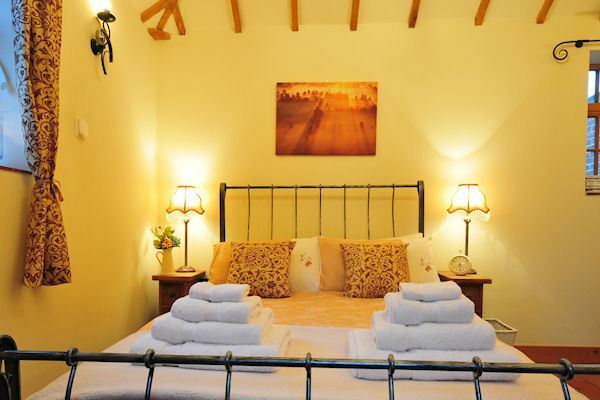 Each cottage has a small private garden with wood furniture, basket swings and barbeque sets. 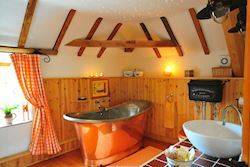 The Bothy is cosy and warm, with a beamed living room and attractive kitchen. Special features include a deep wooden bath, a box bed in the living room providing a sleeping space or daytime snug and a gorgeous little garden – a perfect place to relax. 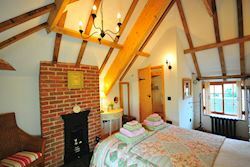 The Hayloft is a lovely retreat with a beautiful bedroom and cosy box bed. The open plan beamed living/kitchen is warm and welcoming, the luxury bathroom has twinkly lights and a beautiful copper bateau bath and a little garden beckons at the bottom of the outside staircase. We offer cookery courses and a few craft courses too in our homely purpose designed kitchen in the stables for small groups of individuals (4 to 5) which means that everyone has time to create something special to take home. Only the best materials are used and all included in the price. You’ll learn a new skill, have a great time, enjoy a lovely home-made lunch with wine and leave at the end of the day with something you’ve created yourself – very rewarding! In addition to the scheduled one-day courses that we offer are our 'Courses just for Two'. These are half day courses, generally in bread making or chocolate making which are £120 for 2 people for the half day which includes a lunch if they choose a morning course or a supper if they choose an afternoon one. We offer courses on the following; Baking Bread, chocolate making, jams & preserves, lavender and bath & beauty products, knitting, crochet plus loads of exciting Christmas courses in November and December. Why not try our new WW1 and WW2 cookery courses which include a themed lunch! A course Gift Voucher is a great personal present for friends and family at any time of the year – birthdays, Christmas, retirements, anniversaries and more. Planning something special for your team or birthday party? We also run courses for team building, birthday parties, house-warming (think, warm bread coming straight from the oven! ), and other special occasions. The number of participants should be between 4 and 6. From this month we are hosting an exhibition to commemorate the centenary of the formation of the RAF. There will be stories and artefacts about several local RAF heroes from both the 1st and 2nd World Wars as well as stories and artefacts about the heroines - the women who stayed and worked 'at home', including those in the Land Army and in the VAD hospitals. Please take a look at our Museum page here.